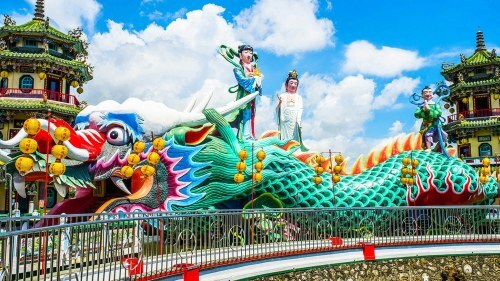 Air Canada is showing flights from Toronto to Kaohsiung, Taiwan for $593 to $615 CAD roundtrip including taxes, with the intra-Asia legs of the journey being operated by EVA Airways, Cathay Pacific, and a few others. 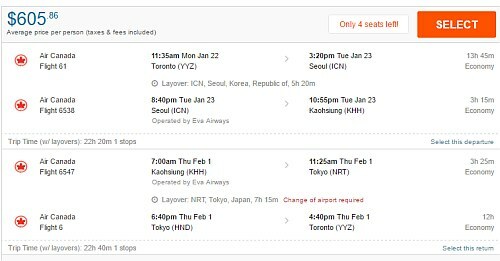 Some flights have 1 stop each way, connecting in Seoul, South Korea on the way there, and in Tokyo, Japan on the way home. Other flights have 1 stop on the way there, and 2 stops on the way home. Or 2 stops on the way there, and 1 stop on the way home. There may be an airport change required on Tokyo, Japan connections (from NRT to HND) on some flights, so watch out for that. Some of the inter-Asia flights are with EVA Air and Cathay Pacific. October, November, and the first half of December 2017. These ones can be a little tricky to find. Try starting with a Monday to Thursday date search. For example: Mon Jan 22 to Thu Feb 1. Next, once your Flighthub search completes, click on 'Flexible Dates' and look for the date combinations that are in the $500s and $600s roundtrip. You can try clicking on those to run a new search. 3. Once your search completes, you can try clicking on '1 Stop' on the left hand side. 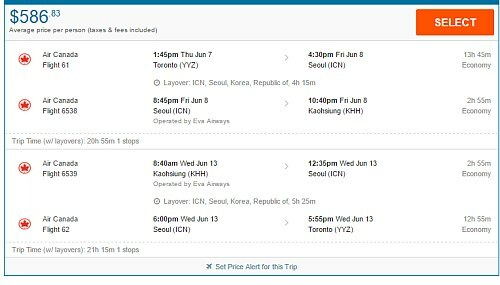 toronto, yyz, flight deals, air canada, asia, east asia, taiwan, cathay pacific, eva airways, kaohsiung and khh.